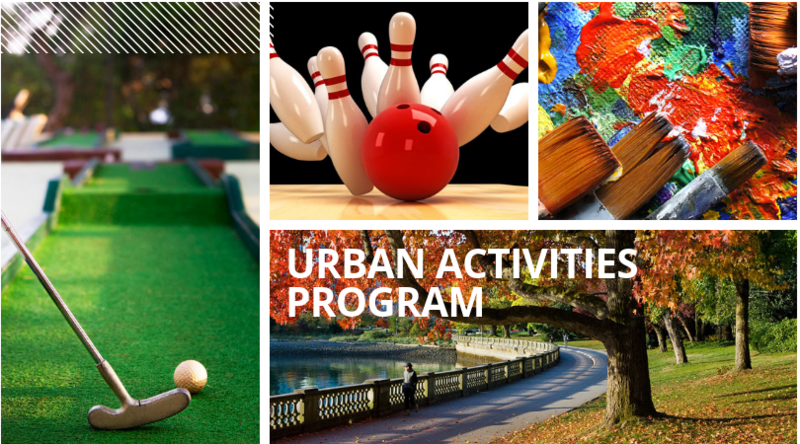 Check out the Urban Activities Program. Bowling, art, sports, park adventures and more! It’s a new adventure every day. Meet new friends and develop your social skills and confidence in a fun, supportive environment. Sign up for a full week, a couple of days or even just one day! Urban activities in Vancouver for youth ages 13-18. Drop Off at 9:00 am. Pick Up at 3:30 pm. Urban activities in Vancouver for youth ages 19-29. Drop Off at 9:00am. Pick Up at 3:30pm. Urban activities in North Vancouver for youth ages 13-18. Urban activities in Surrey for youth ages 19-29. The program fee includes activity costs and transportation during daytime outings. Individual travel to and from the program and other expenses are not included. Participants must bring their own lunch and, if needed, personal and medical supplies. The Society is not responsible for any personal or medical care. A refund will be offered if a cancellation is made at least 7 days ahead of time. After this, no refund will be offered. Click on the questions below for more information. Youth and young adults from 13-29 who have a physical and/or cognitive disability. There will be a youth group ages 13-18 and a young adult group ages 19-29. Participants will arrive at the designated meeting point between 8:30 and 9:00 am, and return back to the original meeting area to be checked out between 3:30 and 4 pm following a debrief. There will be activities throughout the day with breaks for lunch and snacks. Public transit will be used to get to various activities. No. Participants are required to bring their own food and drinks. My child needs to take medication during the day. Will Easter Seals give this to them? The participant or their guardian are responsible for securely packing the medication, labelling it, and taking it as required during the day. Program staff will hold onto medication in a secure bag, but are not responsible for the administration of any meds. How many days can a participant be signed up for? Participants can sign up for as little as 1 day or as many as they are eligible for. We encourage participants to sign up for full weeks of activities! Participants must be signed up for days which fall within their age range. Will Easter Seals pick my participant up for the day and drive them home? No. Participants are responsible for getting to and from the designated program locations. Please note that anyone who picks up a participant must show photo ID and be on the authorized pick-up list. Can a personal support worker attend with the participant? Yes, however personal support worker applications must be filled out with an applicant’s initial application package. Can a guardian attend with their participant? A guardian may attend with a participant as long as they have also completed a registration form for themselves. Guardians must follow the same guidelines as personal support workers and are required to pay for their own activity and transit expenses. How are participants selected and when is the application deadline? Because this is a pilot project, all applications will be reviewed to ensure suitability for the program. Participants need to be physically able to move within the community without 1:1 support. Registration will continue on a first-come first-serve until all spots are filled. There is no hard deadline, though the application process may be closed once all spots are taken. A short interview with the applicant and/or a guardian may be part of the application process after forms have been sent in. We will be in touch with you if that’s the case. $50 per participant per day. Full refunds will be offered for cancellations given with at least 7 days’ notice. We are unable to offer refunds for cancellations offered with less notice than this. When will applications be open? Applications will open April 1st and forms and info will be found on our website. Why not include a session for younger children? While Easter Seals recognizes the importance of programs for all young people, and continues to make this a priority through our camps and other initiatives, as a pilot project the Urban Activities Program is geared toward youth and young adults with diverse abilities who already have a degree of independence and are looking to build more skills in this regard. We are always examining ways of enhancing our programs for children, youth, and young adults, so check back for future developments! Why not offer a session in my area?/I’m disappointed there are no activities in my area. Activities are offered in the areas where there has been the greatest demand. These locations may change in future years. Have a question that wasn’t answered, or just want to offer your input?